Thank you for featuring my storage in your blog! After having it for about four months, I'm still very happy about it. BTW, these aren't actual shoe holders - I got the IDEA from seeing somebody use a back-of-the-door-shoe-holder - but I don't have a handy door to hang it from. I got my pockets from The Dollar Tree and they're only half the size of an actual shoe-holder, which makes them perfect for cards. I fastened two of the units together with eyelets and tape. Great idea! Being new to card making, I only have 8 or so cards complete. Right now they are at the cluttering stage on the hutch on my desk and I need to find a new place for them . . . very timely suggestion! I love this idea, thanks for sharing it! I store them in boxes, etc, and I have categories, but the finished cards only get filed in there about twice a year, so they end up all over the place in the meantime and I can never find one when I need it, ugh! This idea seems very do-able!! That is a great idea! I have a ribbon holder in my office that has a bar under it. I have the cards in bags and then hung on the bar with hooks. It is pretty easy to sort through them to find what I want. 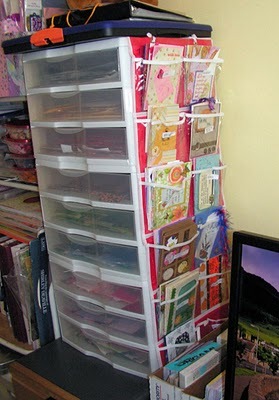 This is neat, although I think I would prefer to store them in a box with catagory dividers to keep the cards dust free. AWESOME IDEA! I just emptied my back of the door shoe thing that my punches were in, so this would be perfect!